Perfect attendance will continue to pay off in more ways than one for students at the Harlingen Consolidated Independent School District as the school year marks the continuation of the Gillman Auto Group of the RGV Drive for Perfect Attendance Awards. The Gillman Auto Group of the RGV and HCISD will continue their partnership for a second year in an attendance incentive program whose goal is to improve student performance and increase average daily attendance by 50 students, equaling approximately $250,000 in additional state funding. As part of their collaboration, Gillman has provided a 2015 Chevy Sonic, as well as a 13” MacBook Pro, an iPad Mini, a Samsung Galaxy Tablet and 40 gift cards, totaling $20,000 in prizes for high school sophomores, juniors, and seniors. 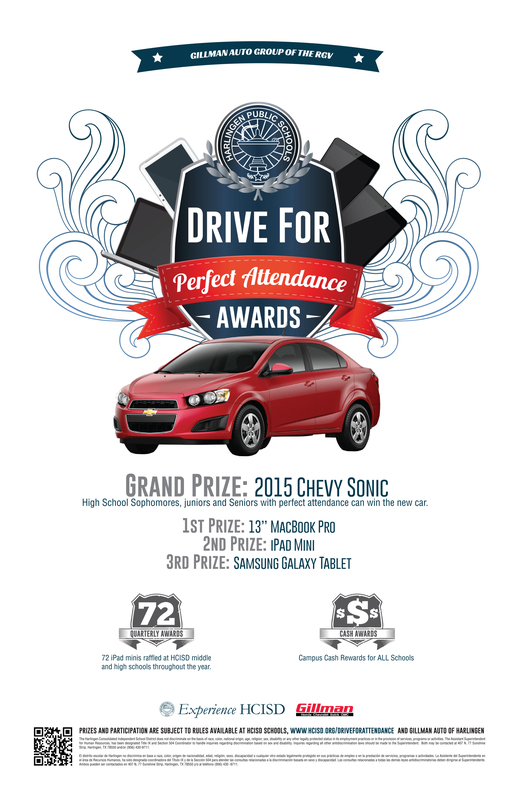 With attendance playing such a critical role in the academic success of a student, this upcoming school year will allow sophomores to be eligible for the grand prize of a 2015 Chevy Sonic. Adding an additional grade level to the grand prize running has already drummed up excitement with incoming sophomores for the school year. Last school year, almost 200 students from 11th and 12th grade qualified for the final awards ceremony held on May 17. Former student and recent graduate from Harlingen High School, Mario De Leon got to drive away to college in his brand new Chevy Sonic. Recent Harlingen High School South graduate, Jandiel Navarro and HHSS senior Israel Guerro received a 13 inch Macbook Pro and an iPad Mini, respectively. HHS senior Cassie Gracia was selected to receive a Samsung Galaxy Tablet, and about a quarter of the students in attendance walked away with American Express Gift cards. Schools in Texas receive funding based on an average daily attendance statistic that is monitored by the Texas Education Agency in six, six-week periods during the school year. Because HCISD meets a state set threshold of migrant students, over 5 percent of the student population, the state considers the district’s best four of the six periods in calculating its ADA. For every student, HCISD receives approximately $5,503 in state funds. In addition to the prizes from Gillman, HCISD will raffle 72 iPad minis at all high schools and middle schools after each academic quarter for students who have had perfect attendance in the quarter, allowing students who miss for illness during one quarter to be eligible for a reward in a subsequent quarter. HCISD will randomly select eligible students for the individual awards in accordance with contest rules and district policies for attendance. For elementary students, HCISD will reward campuses with additional funding for reaching attendance goals throughout the first five, six-week periods with the money used to reward students at the campus level for attendance. In total, HCISD has budgeted $90,000 for the incentive program and Gillman has allocated $20,000 in prizes.